Heat an oiled grill pan over medium high heat or preheat outdoor grill, grate oiled, to medium heat. Pat chicken breasts dry and season with salt and pepper. Grill for 4 to 5 minutes per side. Set chicken aside and allow to cool for ten minutes. When chicken has cooled to touch dice each breast into 1/4-inch pieces. Bring a large pot of water to a boil. Blanche the collard greens for 5 minutes. Using tongs carefully remove the leaves from the boiling water and shock in an ice bath. Once cooled, remove the leaves and set aside onto a sheet pan lined with paper towels. In a large bowl combine all ingredients except collard greens and mix well. Lay a collard green leaf onto a cutting board. Place about 1/3 cup of filling in the center of a collard green leaf. Fold the bottom third of the leaf up over the filing. Take the left side of the leaf and fold it over the filling. 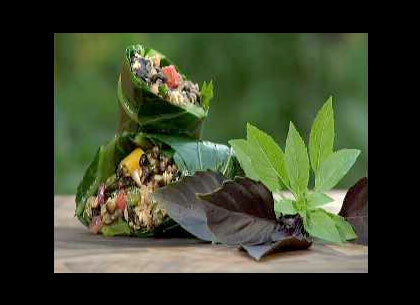 Repeat with the right side of the leaf, and then roll it up to enclose the filling. Repeat using remain leaves and filling. Slice each wrap in half and place onto serving platter. This segment appears in show #3215.